I'm a huge fan of false nails as they are easy to apply and come in such a wide range of pretty designs (which is perfect when you're terrible at painting nails like I am). I usually use Primark's false nails but I recently tried out the Elegant Touch Little Mix Jesy 2 press on nails. The pack comes with 24 nails in 12 different sizes, adhesive tabs, nail file and of course an instruction leaflet. Firstly I will say that I couldn't get on with the stick on tabs, so I applied the nails with nail glue and that method worked fine for me. 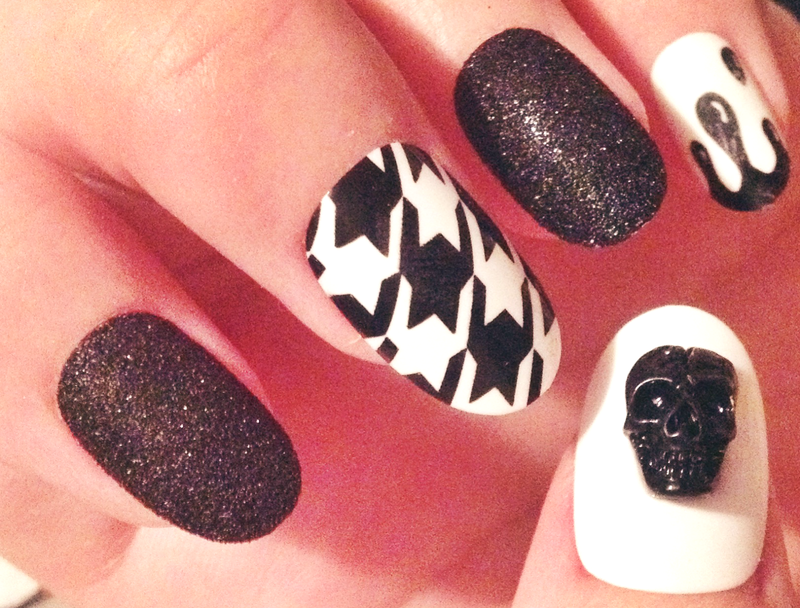 I love the designs on these nails - skulls, glitter and black and white patterns (there's also a white glitter design in the pack too but it wasn't the right size to fit over my natural nails). I have had so many compliments whilst I've been wearing these nails - one person even asked what salon I had visited to have them done! I have been wearing these nails for four days now and they haven't split, the 3D skulls haven't fallen off and I haven't found the designs to fade which has been an issue with false nails I've tried out in the past. I'm eager to try more products from Elegant Touch - they recently released a range of designs with Lily Allen which I definitely need to try out. Are you a fan of false nails? What is your favourite false nail brand? These look awesome! I'm a little skeptical of their durability though. I know you've been wearing them for four days, but I just can't help but think about them falling off whilst doing the washing up. Are they pretty water resistant?